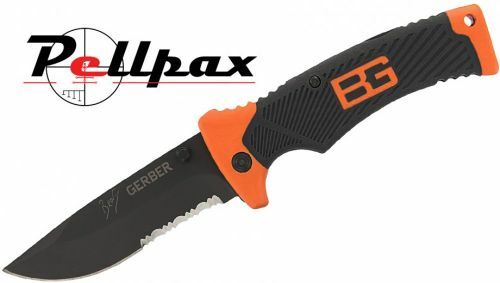 The Folding Sheath knife from Gerber is the result of their collaboration with world renowned survivalist Bear Grylls. As such, this knife is the perfect accompaniment to any outdoor mission. The knife features a generous drop point shape that makes the knife incredibly versatile and powerful with its combination fine/serrated edge capable of tackling rope, branches, vines and other materials. The knife is easily operated with one hand thanks to its double sided thumbstud whilst the rubber moulded handle provides exceptional grip. The knife comes complete with mildew resistant nylon sheath.